How Can I Get the Smell Out of My Kitchen Sink Drain? Proper maintenance and cleaning of sink drains will eliminate odors. Odors build up in sinks when bacteria, food and particles sit in the pipes. Fortunately, several methods will alleviate the smell coming from your sink. Although you can use commercial cleaners to in your sink, they may not help to eliminate the odors that reside. Common household products can aid you in the process, and they will save you money. 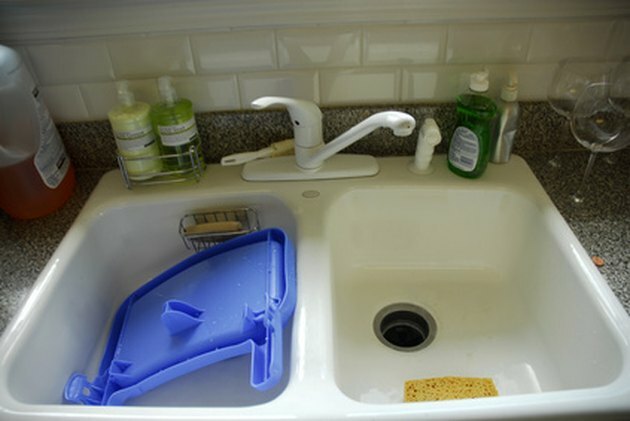 Remove odors from your kitchen sink using a variety of techniques. Run hot tap water into the sink drain. Do this every two to three days to loosen dirt and debris. Pour anti-bacterial dishwashing liquid down the drain to help break down bacteria. Pour 1 tbsp. of baking soda into the drain. Slowly pour ¼ cup of vinegar into the drain. Wait for 30 minutes and run hot water down the drain to eliminate odors. Combine ½ cup of salt with 1 1/2 gallons of water. Place the solution in a saucepan over low heat, and remove it once it begins to steam. Do not allow the mixture to come to a boil. Pour the salt solution down the drain slowly to remove grease build up and odors. Wear gloves to protect your hands. Pour in 1 cup of bleach down the drain to kill bacteria. Make sure you open up windows to ventilate the room.